Patchwork quilting is a craft I’ve never really attempted but I keep coming back to have another look at it to see if there’s something there for me … I’m not so keen on the traditional American patchwork patterns and if I’m honest the patience/time factor has always put me off (I want everything finished NOW!). Then I stumbled across Betsey Telford’s Rocky Mountain quilts (bear with me) on Google the other day. She’s a quilter based in Maine, US – don’t be put off by the trad title and picture of lady (presumably Betsey herself) with suitably soppy dog. Her ‘Christmas’ designs are pretty inspiring with some lovely details and bold designs and have set me off thinking about a long-term project that I could keep buzzing along in the background when I get bored with my quick fixes. 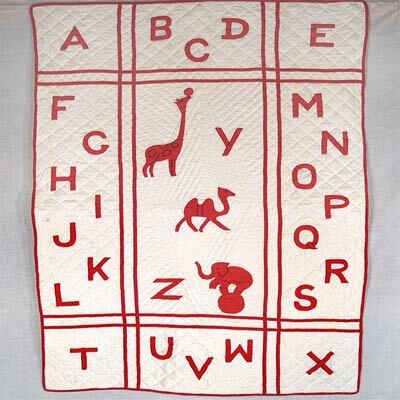 I love this kiddy’s quilt – deceptively simple but bold and effective.